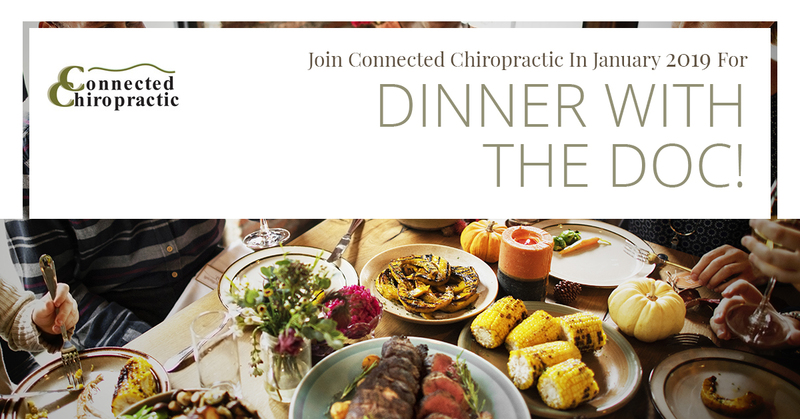 Johnstown Chiropractor: Join Connected Chiropractic In January 2019 For Dinner with the Doc! 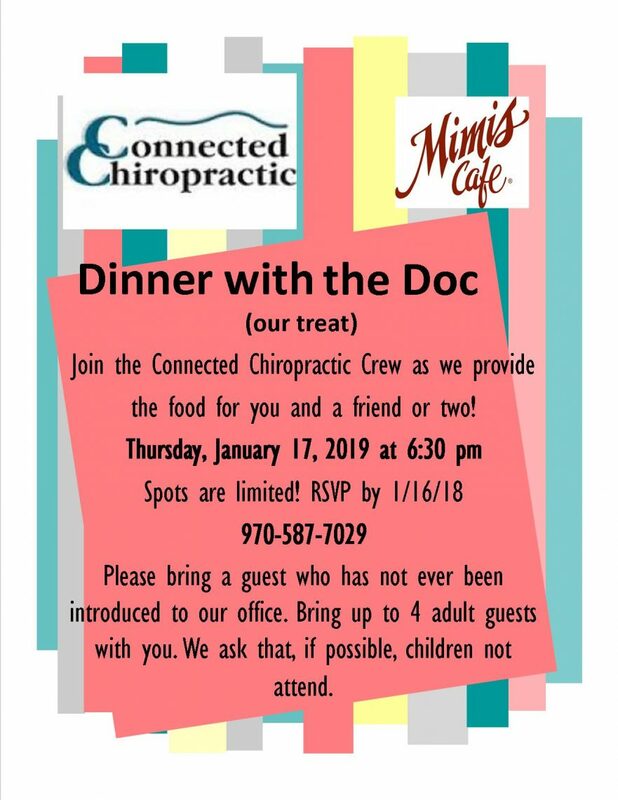 The Connected Chiropractic Crew is thrilled to invite you to join us for a dinner (our treat) at Mimi’s Cafe on Thursday, January 17, 2019, at 6:30 pm. We welcome our existing patients as well as potential new patients to join us for an evening of merriment, feasting, and learning about the chiropractic lifestyle. We invite you to bring a guest who has never been introduced to our office. Feel free to bring up to four adult guests with you. We ask, if possible, that children not attend this event. Spaces are limited, so please RSVP by January 16, 2019, by calling Connected Chiropractic at (970) 587-7029. Want to learn more about our chiropractic care? Visit Connected Chiropractic and discover what your Top Rated Local® Johnstown chiropractor can do for you! In the meantime, here are a few more details about our meet-and-greet dinner event. On the evening of January 17, 2019, we will meet at Mimi’s Cafe to dine on a delicious meal while getting to know individuals in our tight-knit community. Dr. Brad Cranwell will discuss the benefits of proactive chiropractic treatment and share insights into why he is so passionate about what he does. Guests will learn more about his background, personal interests, and compelling stories. We invite any of our existing patients to offer their own testimonials and experiences with the chiropractic care they receive with Dr. Brad. Additionally, we welcome our new friends who are not currently patients with us to feel free to ask questions about Dr. Brad’s care and approach to chiropractic. 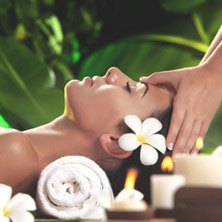 In addition to chiropractic treatments, we offer massage therapy under the care of several skilled massage therapists. Please feel free to ask any questions you may have about massage therapy, the benefits of these healing, rejuvenating treatments, and the value to be gained from receiving both chiropractic care and massage. We are honored to have such amazing patients who we have built lasting relationships with in the years they’ve been in Dr. Brad’s care. This dinner serves as a way for us to thank you for continuing care with Dr. Brad, as we value each and every one of you, and the opportunity you give us to learn and grow as a chiropractic team. For those individuals in our community who have not been introduced to our office, we would love to take this opportunity to get to know you. Additionally, we want to introduce you to our approach to health and wellness care vis chiropractic treatments, our treatments, and the philosophy behind our practice. We will share insights with you about actively living a chiropractic lifestyle that focused on prevention and maintaining natural health as an alternative to simply treating pain when it occurs, and managing pain. We would be honored if you would join us for this fun, educational, and enriching event on Thursday, January 17, 2019. Please be sure to RSVP by January 16, 2019, by calling your Johnstown chiropractor at (970) 587-7029. We look forward to seeing you then! From all of us Connected Chiropractic, we wish you happy, healthy holidays, and a wonderful start to the new year!